This online form follows the cutting instructions printout forms. For your convenience, we have placed these online, step by step form here along with a chart to help you. If you have questions, please call us at 616-891-8447.We are happy to assist you through this process. Not all of the pig is edible pork. On average about 54% of a pig makes it from the pen to the pan. A 250 lb. hog will yield approximately 136 lbs of custom cuts. Around 28% of a pig’s live weight is inedible product removed during the slaughter and dressing procedure bringing our 250 lb. live pig to 173 lbs. dressed. The internal organs, skin, blood, feet, and other inedible products account for most of this loss. Once the carcass is sanitarily dressed it is hung on a rail and placed into a cooler where it is quickly chilled. After the carcass is thoroughly chilled it can be cut. Another 20% of the weight is removed during processing bringing our 173 lb. carcass to 136 lbs. Bone dust, fat trimming, de-boning, grinding, and moisture loss account for this unpreventable waste. Hams and bacon are typically cured and smoked after cutting. *Weights vary due to species, genetics, feed regimen and age. Our newsletter is once a quarter and contains valuable coupons and even some freebies. We do not sell your information and you are free to opt out anytime by clicking “Unsubscribe” at the bottom of the newsletter. Try it and see what we have to offer. You will notice that almost any part of a pig may be cured and smoked. Smoking is .83 per lb. 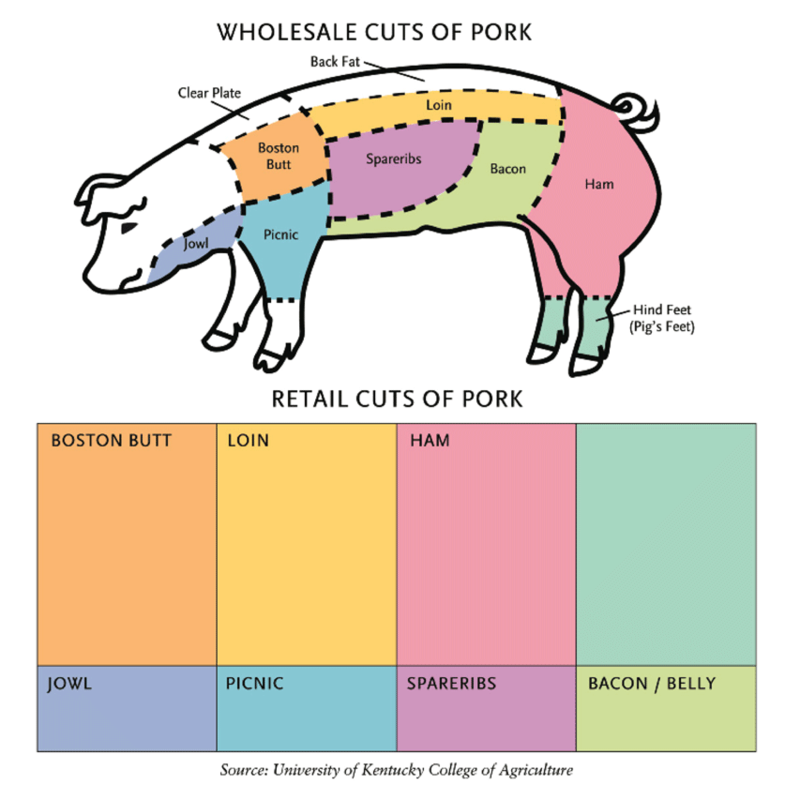 Here are the standard cuts of your pig. HOCKS: No **If hocks are not ordered, the meat is trimmed and put into sausage. If hocks are not ordered, the meat is trimmed and put into sausage. Choose your seasoning of sausage. *Links .83/lb - Patties .65/lb. Choose your style of sausage.